The offer so crazy Rick's staff want him put away!!! 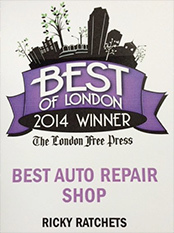 Ricky Ratchets Auto Repair is a family owned, full-service auto repair shop in London, Ontario. Visit all of our pages for the services we provide, promotions, car maintenance tips, and even what our customers say about their experiences with Ricky Ratchets Auto Repair in London Ontario. At Ricky Ratchets, we pride ourselves on being “Your Convenience Experts” with our trademarked “Auto Repair Store at Your Door™” program. We are the air conditioning, safety check, mufflers, suspension, steering, ball joints, tie rod ends, heater, coolant flush, tire rotation, thermostat, tire and brake repair experts! Hear what our awesome customers have to say! Whether you hear a click and a clack, your check engine light is on or even if you want some peace of mind, we can do a full diagnostic and let you know what maintenance is required on your vehicle. We are also fully licensed to do e-tests and safety inspections on behalf of the Ministry of Transportation. Something’s not right, you can feel it, hear it, smell it. Don’t put your safety or your families safety or the safety on those in the community on the line, come in to us and we will make that only what needs to get fixed, gets fixed, and fixed right. We pride ourselves on honesty. Keeping your car regularly serviced will preserve the life of your car, and save you money in the short run (because you will have less minor repairs) and in the long run (because your vehicle will last longer. We can help you create a maintenance plan for your car, and we maintain excellent records so you know what is needed on your car and when. One of the worst things about getting into an accident, is that while you are recovering you have to jump through the hoops of getting your car fixed. Let us make the process as painless as possible for you, and give you your car back looking brand new. We also do minor body work and repairs to all makes and types of vehicles. At Ricky Ratchets one of our greatest passions is restoring classic cars to their former glory. We have done them all, restored cars from the 50’s to the 90’s. If you have an old car you want made new, we’d love to help. Order Your Car Repair Online! 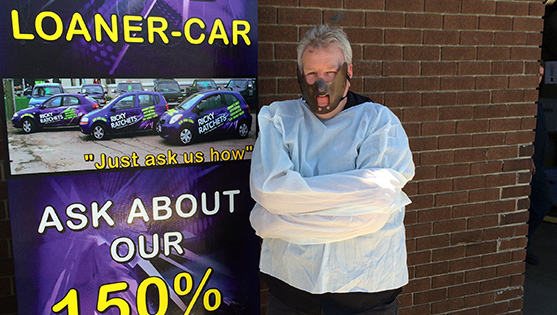 Let us buy your used car! Got a vehicle you want to get rid of? 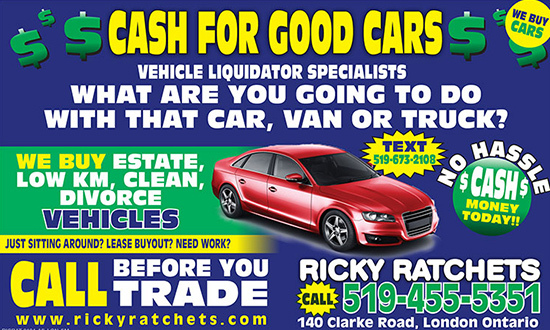 Who will buy your car, truck or van quick, fast and easy in London Ontario, even if it’s broken? Do you lose money at the auto wrecker? Or take a terrible trade-in at a car dealership? Are you in a lease that you just want out of? Would you like to get paid cash for your car? Ricky Ratchets appraises vehicles right on the phone using your year make and model with your kilometres, and you can text him your pictures of the vehicle to 519-673-2108. Then Rick will come out to look at it or you can bring it by our shop right in London Ontario . Join our mailing list and receive a free newsletter created by the staff at Ricky Ratchets in your mailbox each month. The newsletter contains great tips on car maintenance, ongoing promotions at the shop to help you save even more! And it’s not all about cars – there are great recipes, jokes, articles – a great read guaranteed!